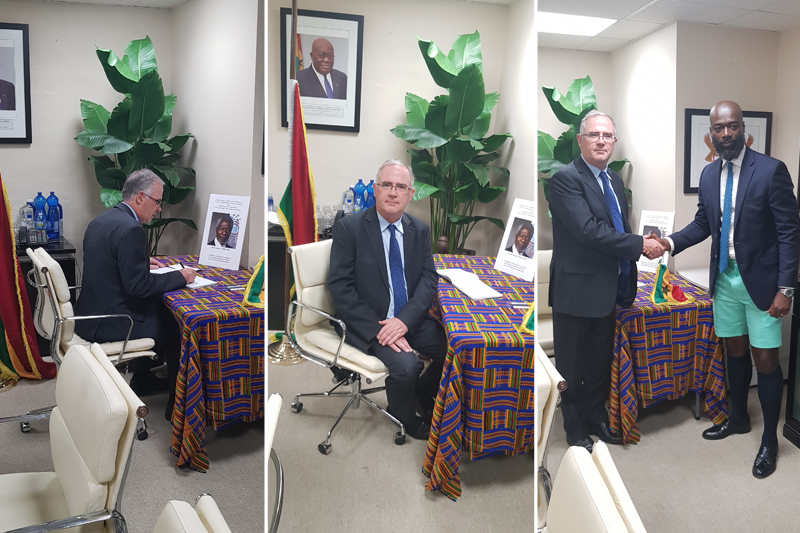 [Updated] The Honorary Consul of Ghana in Bermuda Dr. Leonard Teye-Botchway announced that a condolence book will be available to pay tribute to the late Kofi Annan, the former United Nations Secretary-General and Nobel Peace Prize Laureate. The condolence book will be opened at the Honorary Consulate Office in Suite 6, 129 Front Street from 12 noon – 6 pm from Tuesday, August 21 – Friday, August 24, 2018, and the Governor will be signing the condolence book this afternoon. In announcing his death, the Kofi Annan Foundation said, “It is with immense sadness that the Annan family and the Kofi Annan Foundation announce that Kofi Annan, former Secretary General of the United Nations and Nobel Peace Laureate, passed away peacefully on Saturday 18th August after a short illness. His wife Nane and their children Ama, Kojo and Nina were by his side during his last days. “Kofi Annan was a global statesman and a deeply committed internationalist who fought throughout his life for a fairer and more peaceful world. During his distinguished career and leadership of the United Nations he was an ardent champion of peace, sustainable development, human rights and the rule of law. “After stepping down from the United Nations, he continued to work tirelessly in the cause of peace through his chairmanship of the Kofi Annan Foundation and as chair of The Elders, the group founded by Nelson Mandela. He was an inspiration to young and old alike. “Kofi Annan was a son of Ghana and felt a special responsibility towards Africa. He was particularly committed to African development and deeply engaged in many initiatives, including his chairmanship of the Africa Progress Panel and his early leadership of the Alliance for a Green Revolution in Africa.